Hiab, part of Cargotec, is delighted to announce that Marshalls plc has been awarded the Chartered Institute of Transport and Logistics' prestigious Safety Award for 2015. The CILT's annual awards are designed to recognise achievement, high standards, and professionalism in the transport and logistics industry. Marshalls is the UK's leading supplier of hard landscaping products. 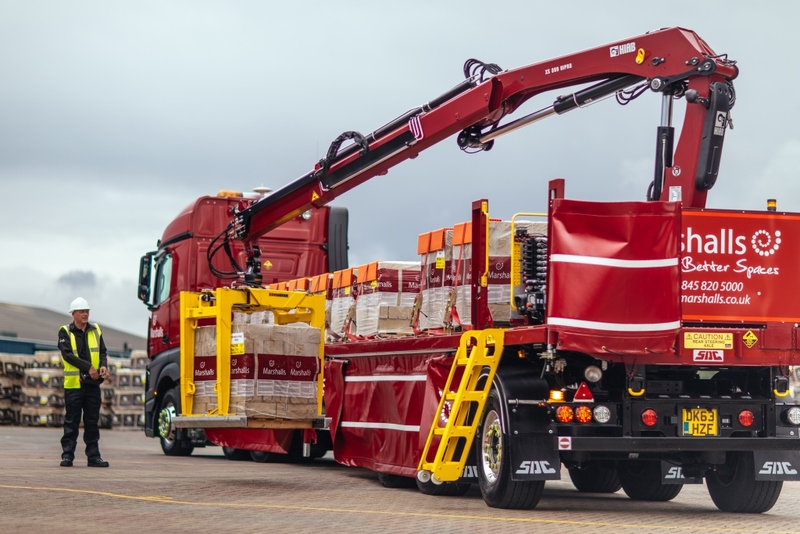 It operates the largest fleet of 44-ton crane offload delivery vehicles in the country, and faces daily safety challenges as it delivers the company's products to building sites, homes, and builders merchants' yards. It has a long history of concern for the safety and welfare of not only its drivers, but also everyone else who encounters its delivery vehicles. 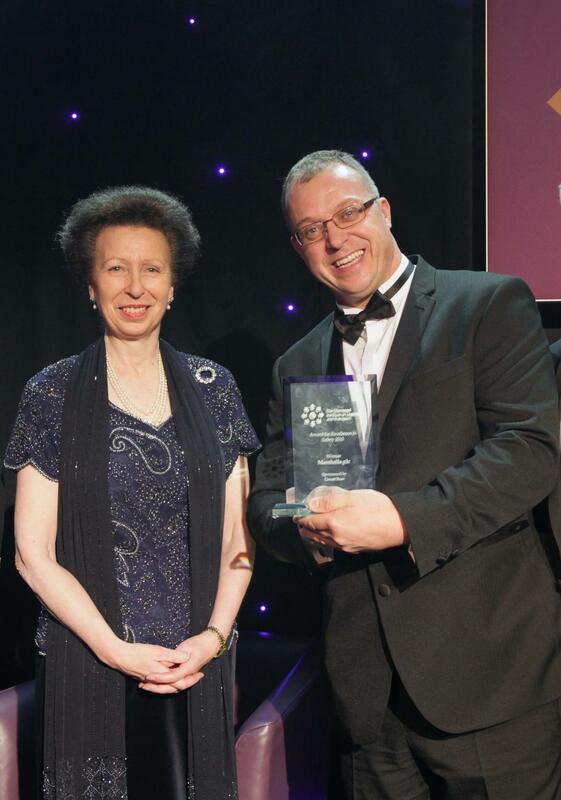 "We are absolutely delighted to have been presented with the CILT's Award for Excellence in Safety," says Guy Ripley, Regional Logistics and Fleet Manager at Marshalls. "This award is the culmination of several years of challenging development with our equipment suppliers. Together, we set about the task of designing a modern delivery fleet that incorporated the very best equipment available, with the specific requirement that the safety of the operator, customers, and other road users - especially vulnerable ones such as pedestrians and cyclists - was to be a top priority. The vehicle designs had to meet not only our own safety-related aspirations, but also those of the many blue chip clients we work with." Marshalls, Hiab, and SDC Trailers, one of the largest bespoke trailer manufacturers in Europe, worked closely together to develop a comprehensive solution that covered Marshalls' many safety requirements. "The new vehicle designs have led to a significant reduction in accidents and injuries to both our own employees and other people. Our entire fleet is now designed to the new high level specification, making it the envy of the industry, and giving us an ever-improving accident record in an increasingly demanding work environment," comments Ripley. Marshalls has included safety innovations such as 360o recording CCTV systems that give the driver a view of the entire vehicle and, crucially, the load whilst in transit; cycle proximity sensors that detect hidden cyclists and pedestrians when the vehicle is turning left; and axle weight indicators to ensure the load is evenly spread and does not exceed the axle limits. Soft fall-restraint curtain sides that retain cargo in the event of an accident are combined with bespoke load securing equipment that utilises the load lashing points and punch plate decking built into the trailer, giving the driver multiple ways to secure the load safely during transit. The trailers have a specially designed access system that offers the highest levels of safety when climbing on and off the vehicle. Hiab provided Marshalls with the HIAB XS 099 HiPro Roller crane, which is unrivalled in performance and weight in today's market. "Using a combination of ultra-high strength steel and lightweight alloys, a lightweight engine, and optimised hydraulic and electronic systems, we designed a crane that weighs only 2000kg including the grab, yet delivers fast and smooth control, low fuel consumption, and is supremely safe to operate, with a fingertip-light state-of-the-art remote control system," explains John Bailey, Hiab's Global Key Accounts Manager. "The success of this project was only made possible by working with the best suppliers in the business, who were able to share my vision and make it a reality. We chose HIAB cranes and SDC Trailers because of their unbeatable equipment and product support. Together, we have produced a vehicle design that is, in my opinion, industry leading, and has surpassed all of my expectations," concludes Ripley.